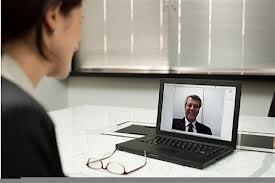 Virtual video interviews are becoming an increasingly important part of the job search process. Using this technology, companies can more easily screen candidates regardless of their geographic location, which is especially useful for military personnel who are stationed around the globe. In fact, companies will soon be conducting “live” video interviews through Corporate Gray Online. These “live” video interviews allow for a virtual face-to-face conversation between a recruiter and candidate. Some companies also use one-way video interviews, whereby the candidate answers a set of pre-screening questions that are recorded and viewed later by the recruiter. Whichever type of digital interview you encounter, preparation is important for a successful experience. List the possible questions you’ll be asked, and create a script of clear, concise, and well thought out answers to practice and prepare. List questions you want to ask the interviewer, in case they offer this ability at the end of the interview. Research the company so your questions and answers are relevant to the recruiter and the firm. The best candidates ask the best questions. For two-way interviews, give the recruiter your full attention with absolutely no distractions that could be detected or deter from your performance. After the interview, contact the recruiter to thank them for the opportunity to interview, and recap your skills and interest in the job and their company. Don’t be afraid to ask for the job at the end of the interview! But what about preparing for a video interview in particular? You should expect to participate in video interviews at some point during your job search. “We’ve been using digital interviews for the last three years, and the process is becoming more and more common,” says Lisa Carroll, Search Executive for Kopplin & Kuebler. Dress appropriately from head-to-toe. That’s right, even from the waist down! You don’t want a recruiter to catch a glimpse of inappropriate clothing in case you adjust your position. Plus, you’ll feel more professional and in character. Avoid patterned or white clothing. Patterns can often give the illusion of movement on camera, and white can be unflattering and add glare. Test the Internet connection, lighting, video, and sound. If possible, use a wired (vs. wireless) Internet connection. This provides a stronger and more dependable connection. The best webcam placement is just above your sightline. Looking up slightly is a more flattering angle and it encourages you to sit up straight. Being in front of a camera can be intimidating and uncomfortable, especially if you don’t have much practice. So practice, practice, practice, and remember to smile – it goes a long way on a digital interview. If a one-way video interview allows for practice questions, take advantage of them to check your settings and get more comfortable with the process. Choose a quiet place to interview. Have a clean desk and simple background so that nothing distracting is picked up on the audio or video. Put pets away, and let everyone who is home know that you will be interviewing. If necessary put a do-not-disturb sign on the door as a reminder. Ms. Carroll had difficulty evaluating a candidate whose interview included a chirping bird in the background. Close other programs on your computer so the interview is not interrupted by a signal, such as a message on Facebook or an incoming email. Remember the interviewer should have your undivided attention. Remember to look into the camera, not at the screen, when answering questions. The camera is your target for making eye contact, which is just as important in a video interview as in-person (consider taping a sign next to the camera to remind you). It is okay to look at the interviewer when they are asking the question, but direct your responses directly to the webcam. Seeing yourself on camera is helpful to check how you appear to the recruiter, but don’t let it distract you during the interview. If you find your own image on the screen distracting, close that window if possible, or cover it with a post-it note. Be aware of the timing so that your answer is not cut short on a one-way recorded interview. Don’t be afraid to make a mistake and start your answer over. Everyone makes mistakes, and it’s better to fix your answer than continue with a poor choice. Avoid using hand movements, which are more distracting on video than in-person. Use the notes you prepared, but don’t rely too heavily on them for your answers. Prepare them so they can be quickly scanned for thoughts and ideas, but don’t use them like a script. Although some of the tips above might seem obvious, they are not to be taken lightly. Don’t risk a negative evaluation just because you didn’t properly prepare! If you have more advice for candidates who are anticipating a video interview, please share your tips below. Lisa Carroll, Search Executive for Kopplin & Kuebler, conducts General Manager, Executive Chef, Assistant General Manager, Clubhouse Manager, and Chief Financial Officer searches in the private club industry. This entry was posted in General, Transition Advice and tagged career advice, career transition, interview advice, interview questions, interviewing tips, job search advice, military to civilian transition, military transition, transition advice, Video Interviews by Karin Durkee. Bookmark the permalink. Thank you for always keeping veterans updated with the most current information. It makes my job as a veteran advocate a lot easier and keeps me current as well. Thanks for your comment, Vanessa. I’m glad our articles are useful to you and the veterans you help! Heard of a candidate who hung a sheet to hide the mess behind him. With the sheet up the unanswered question was “What’s hiding behind the sheet?” That question was answered when the sheet fell down half-way through the interview! That’s a good lesson learned, Bob, thanks for sharing! Copyright © 2019 Corporate Gray Blog . All Rights Reserved.